James has ambitions of working for the Law Commission, so London South Bank University's (LSBU) location in the heart of London, with quick access to Parliament, the House of Lords and County Court, was very important to him when making his decision on where to study. James is studying LLB Law, and has been more than happy to take advantage of the opportunities for developing professional skills offered at LSBU. LSBU organises Street Law, which sees law students help school and college students understand everyday legal matters, and the potential ramifications of breaking the law, by taking part in a mock trial. James returned to Croydon College, where he studied his Diploma in Law. "We delivered a mock trial and talked to them about the danger of knife crime and gangs," he explained. "It's definitely been my favourite experience on the course so far." James has also been involved in two of the volunteer schemes organised by LSBU that allow students to gain valuable professional experience. In the Legal Advice Clinic I had the opportunity to interview clients and give them legal advice which was an amazing opportunity, and a good insight of what I will be doing once I start working in a law firm. James volunteered In Lambeth County Court too, where he had the opportunity to work with clients as well as to sit in on a court hearing and learn how the law works in practice. The law courses at LSBU have a strong focus on employability and this is delivered in part through the 'Working in the Law' module, which includes a week's work experience. "The module has been really good," said James. "It has given people the opportunity to work in law firms, law centres, courts and advice agencies. It's an opportunity that not many institutions offer to undergraduates." James has also made use of the university Employability Service who were able to provide assistance with his application to work for Westlaw. 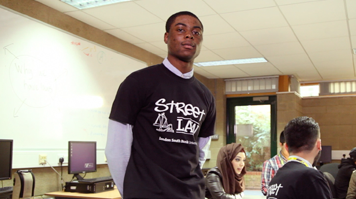 Watch our video, featuring James, about what it's like to study Law at LSBU.